- Reservations are taken for weekends and holidays only. - The only boats we reserve are pontoons. - The reserved boat must be picked up by 10 AM or earlier. - There is a 4 hour minimum rental on all reservations. - A credit card number is required for all reservations. - If for any reason you can't make it, call us before 8:30 AM the morning of your reservation or your card will be charged for 2 hours of rental. - Reservations must be placed at least one day in advance. Yes, pets are allowed for an additional $5 fee per pet. No, personal grills are not permitted for safety reasons. We have gas grills available to rent for an additional $14 on top of the total bill. Do I need to have any experience driving boats to rent one? No experience is needed to rent any of our boats. We will give you an overview of how to operate the boat before you leave the dock. Where am I allowed and not allowed to go while renting? There are a few places that we do not allow our customers to take our motorized boats. This is to protect the motor from hitting any shallow areas. These restricted areas can be found by clicking here. Do you sell any fishing bait or rent fishing equipment? We sell night crawlers by the dozen. We do not have any other kind of bait or fishing gear. Do you sell or auction off your boats at the end of the season? No we do not. This was done by the previous owners over 10 years ago. 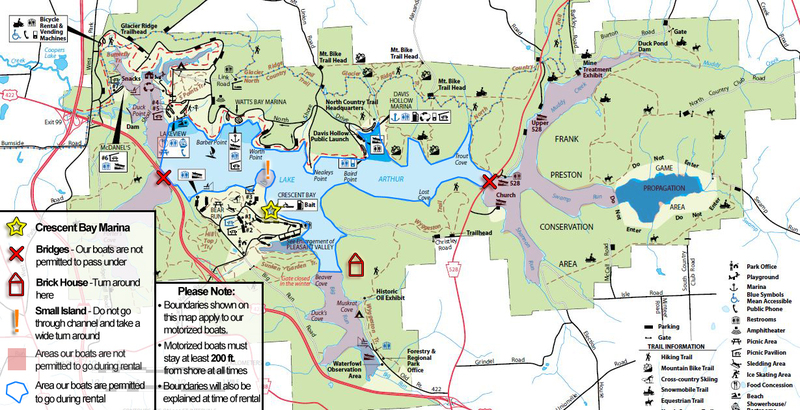 Do I need a fishing licence to fish at Moraine State Park? Moraine State Park and Lake Arthur is state owned. By law, anyone age 16 and over fishing in public water is required to have a visible fishing licence on them. We do not sell licences at Crescent Bay, but you can get one at most sporting good stores. What happens if the boat is damaged during rental? Safety is our number one concern for our customers, equipment, and others on the lake. For this reason, we are very specific on where our customers can and cannot go while renting and will explain how to be safe prior to undocking. If our boat(s) become damaged during rental, the customer may be responsible for the damage. The most common types of damage caused to our boats are broken propellers from traveling too close to shore and, in rare cases, damaged lower units. Broken propellers will incur a fee of up to $175 and damaged lower units will incur a fee of $800. Please avoid shallow areas and follow the safety instructions explained by our crew to avoid any chance of injury or damage occuring. Private towing is also a service we provide for a minimum of $80.